Islamophobia is a neologism that is being relatively used specifically in regard to the relation between Islam and the West. 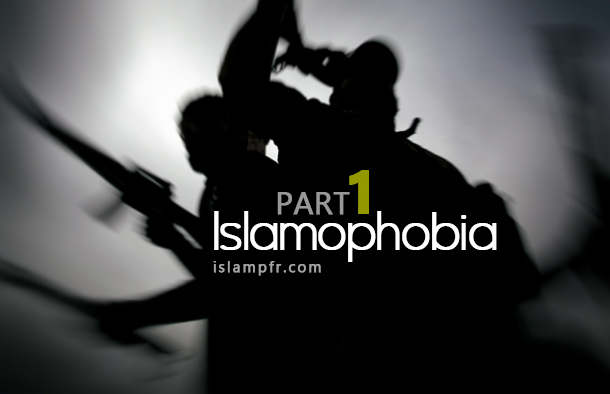 This term which is partially taken from the concept of psychological phobia was initiated to interpret the phenomenon of pathological fear of Islam. Islamophobia dates back to the advent of Islam; however, it has become especially prevalent in the Western countries after the September 11 attacks. It can be said that this phenomenon is due to the long history of the turbulent relations between Islam and the West which has deeply rooted a fear of Islam in the Western minds. . This has caused them to look upon Islam as a serious threat, threatening everything Western. Perhaps the root cause of this mentality is a historic recurrence happening between the rise of the Islamic civilization and the decline of the Western civilization. The pathological fear of Islam first emerged among Arabs and the corrupt Jews in the Arabian Peninsula. Treating an illness and solving the problems rising from it requires a clear understanding of the phenomenon first. This study presents an analytical approach towards the phenomenon of Islamophobia and its factors which are related to the Islam-West relations and offers solutions that could contribute to solve such a worrying situation which has subjected the Islamic world and Muslims to a series of continuous misunderstandings and misbehaviors. Like any other phenomenon, the analysis of Islamophobia is not limited to a single factor. There are several factors for Islamophobia with different degrees of importance. Here we will explain the most important ones. Farewell, a long farewell to Syria, my fair province. Thou art an infidel’s (enemy’s) now. Peace be with you, O Syria – what a beautiful land you will be for the enemy. History is full of endless unpleasant encounters many of which have turned bloody. This has shaped an ambivalent or rather an antagonistic attitude in the West who is the heir to the Roman Empire towards Islam and Muslims. And that is because these painful experiences have not stopped in the borders of Yarmouk. Instead, they have extended to violent confrontations, some of which are still counted as a source of threat to the Western world. Such as the Muslim conquest of Hispania, al-Andalus, in the early 7th century and the Battle of Tours/Poitiers (also called the Battle of the Palace of the Martyrs) in 732 AD in which if the Muslims had become victorious, Islam would have also penetrated into the heart of Paris. Another example is the Ottoman conquest of Constantinople in 1453 AD, among other numerous bloody clashes between the two sides. It seems that the direct interaction of the Western people with Muslims over several decades either during the occupation of Muslim lands during the Crusades or through dispatching Western tourists and students to benefit from the Islamic scientific movements and progressing civilization in many Islamic cities, was not sufficient to correct the darkly-depicted picture of Islam and Muslims and the wrong description of Islam as a bloody religion associated with violence, backwardness, and terrorism in the Western mind. According to popular belief (and a hadith (narration) from Imam Ali (AS)), people are usually hostile to what they are ignorant about. It means they ignorantly consider what they do not have much knowledge about to be a complex threat to themselves and try to avoid it. This can explain the fear and hatred of Islam and the tendency to fight against it among the Westerners. There is a superficial knowledge of Islam in the West which has been taken from unreliable resources and/or the ones that lack a comprehensive knowledge of Islam. Moreover, the academic curriculum in the West still include false and misleading information about Islam that comes from Orientalism, the doctrine that has been the main excuse for the colonialist West to rely on. Orientalism has its roots in the middle ages and is affected by a crusading spirit. According to a researcher, a small amount of what neo-Orientalists generate, which is indeed a huge volume, reach the hands of Western policymakers while the rest is used by the modern propaganda through the media to shape and control people’s opinions. Neo-Orientalism aims to put the West in a culture clash with the Islamic East both in theory and practice. The role of the Israel lobby (as a pressure group) to present a negative image of Muslims and to depict Israel as a weak government being threatened by the Arabs and Muslims. Presenting Christian and Jewish ethics as the acceptable global ethics worthy of following in the American society; avoiding from introducing the Islamic morality; and presenting an extremely negative image of it to the extent that Judaism and Christianity appear as the correct patterns of progress, civilization, and morality to follow in the American view. In this context, Islam is depicted as backward and dangerous. Accusing Islam of terrorism, bigotry, sexism, intolerance towards non-Muslims, rejecting democracy, and instructing to worship a strange and vengeful god. The fear of the West from the growing number of their people converting into Islam and the threat of a potential war between Islam and the West in the future. That is why they would scare their people of Islam through Zionists in order to be able to continue their support for the Zionist regime. Even though the West’s ignorance of Islam is a key factor for Islamophobia and fighting against Islam, it is certainly not the only one. Many of today’s Western norms and behaviors are in unavoidable conflict with Islamic standards. Some of these norms go back to the principles of the Western pragmatic capitalist system including utilitarianism and pleasure-seeking which are, at the same time, recognized as social and economic freedoms such as gambling, drinking alcohol, legalization of prostitution and homosexuality, etc. It is quite natural that these Western norms are not acceptable to Islam and Islam forbids such practices and considers them sins deserving punishment. Thus, naturally enough, the West considers Islam and Islamic teachings to be a serious threat to what it calls ‘essential unquestionable freedoms’. On the one hand, it could be said that a part of the current conflicts that govern the relationship between Islam and the West is rooted in the deep civilizational differences that have always existed throughout history, as Samuel Huntington in his book “The Clash of Civilizations” says. On the other hand, it could also be said that an important part of this challenge is due to the conflict of interest between Islam and the West. The West is partly ready to embrace a moderate Islam which guarantees its political and economic interests and does not pose any threats to them. The Islamic nation has encountered many crises at different levels across the centuries, and these crises have prevented Muslims from effectively participating in forming the human civilization and enhancing human life compared to other nations. At the political level, the wars and armed conflicts still take a large number of human lives in Islamic countries such as Palestine, Iraq, Afghanistan, Sudan, and Algeria. Islamic countries are unable to stop or overcome these conflicts, but many of them still follow foreign powers who take away their freedom and limit their practical independence. At the economic level, statistics show that more than half a billion Muslims live below the poverty line. This means that more than a third of the inhabitants of the earth who live under the poverty line are Muslims while Muslim countries have got abundant natural resources and human capital. At the social level, one could discuss the severe and growing class difference that exists in Muslim countries, in addition to degradation of women, , neglecting the youth and children, and instability of value systems which are being invaded by the Western cultural imperialism. On the cultural level, it seems that the Muslim world has almost entirely been cut off the epistemological, scientific, and information revolutions which the world has witnessed, and has had the lowest possible share in these revolutions. It has been at best an insatiable consumer of technological achievements. Due to this unfortunate situation and the efforts of the Zionist and colonialist movements to worsen the problem in order to magnify the plight, it is quite natural that one associate Islam with poverty and backwardness and attribute such weaknesses of Muslims to Islam. Therefore, it is very difficult for a Westerner who has only known an ugly and distorted picture of Islam to relate themselves to it and not consider it as the key factor of the backwardness of a great part of the world and not stand against it. In fact, principles, theories, and specially ideologies have an ideal framework but allow their followers to reasonably distance themselves from them. However, in many cases, the ideology and its practitioners are confused, and human errors and faults are usually attributed to the ideology itself and not the practitioners. This is the case for Islam and Muslims as Islam has always been blamed for the mistakes that some Muslims make because the interests of colonialists and Zionists demand to attribute the wrongdoings of some Muslims to Islam in order to defame it and reinforce the negative images of Islam in the Western minds. By studying more about such deliberately-prefabricated images and ideas of Muslims that have become fixed in the Western mind throughout a long history of conflict and unbalanced relationship between Islam and the West, we realize that Muslims are unfairly encountering a huge amount of slander and misunderstanding. These images accuse Muslims of lechery, gluttony, stupidity, foolishness, deceitfulness, humiliation of women, etc. The biased movie industry and the media which are dominated by the Zionists have a very special role in supporting, magnifying, deepening, and presenting such images as actual and unquestionable facts. The truth is that even some Muslims play a significant role in reinforcing such offensive images by their deviant and backward behavior during their trip to different parts of the world and present a very ugly example of a Muslim character and consequently Islam. Also, the dogmatic implementation of Islamic teachings by some Islamic governments which present only a shallow interpretation without deeply understanding them, is among the reasons for people to insult Islam and scare others from it, because it is perceived that such teachings leave no choice for these governments to act like a ruthless executioner who deprive people of any freedom, joy, and happiness and force them to perform the religious rituals only. Deadly bombings which target civilians in the Western countries including the US, the UK, Spain and some Islamic countries such as Saudi Arabia, Pakistan and Jordan by the groups who introduce themselves as Islamists such as al-Qaeda, will increase the intensity of Islamophobia and give more excuses to the enemies of Islam to fight against it. In fact, they consider Islam responsible for terrorism and terrorists.